The economy could receive a boost worth billions if England make it to the World Cup final, research suggests. Work done by the Centre for Retail Research (CRR) estimates that the economy has benefitted from extra spending of more than £1bn this year. The centre estimates that spending will rise to £2.7bn if England makes it to the finals. It says much of the spending will be at shops with fans stocking up on food and drink before watching matches at home. 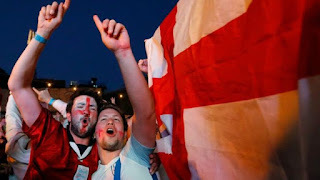 Professor Joshua Bamfield, CRR director, said the amount spent so far was about £800m more than during the 2014 World Cup when England crashed out of the tournament before reaching the knockout stages. In its report on the last World Cup the CRR says: "Every goal scored by an England footballer - right the way to the final - would be worth £165.3m to England's retailers and an extra £33.2m to pubs, hotels and restaurants." However England goals in 2014 proved to be thin on the ground. Prof Bamfield said: "At the last World Cup we didn't get past the group stage and from a retail point of view sales fell off a cliff. "This time no one expected much - they were so used to being kicked in the teeth - but once they started playing it all changed. "The spending patterns also fit in with the current retail theme of 'experience'. People want to spend their money going to the pub or having a barbecue with their friend and watching the match."